Mario dei Fiori (originally Mario Nuzzi), Italian painter. He was the first and most famous Roman painter to specialize in flower-pieces and one of only four still-life artists included by Leone Pascoli in his collection of artists biographies. The early sources and old inventories attribute many flower paintings in distinguished Roman collections to the Caravaggesque painter Tommaso Salini, and since the 18th century Mario s name has been linked with his, and it has been assumed that he trained with Salini. This apprenticeship is difficult to document, yet a comparison of Mario s pictures with inventory descriptions of works by Salini confirms that Mario was influenced by his art. 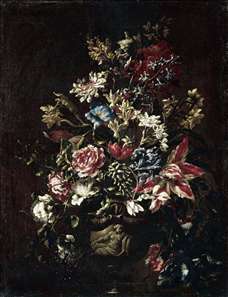 To the minute observation of various kinds of flowers, Mario added a refined sense of design and an interest in effects of light, still linked to Caravaggio in the use of a dark background. He also responded to the art of the Neapolitan flower painter Paolo Porpora, who was in Rome from the early 1650s, in the service, as was Mario, of Cardinal Flavio Chigi. He painted the flowers on several paintings by Carlo Maratti, such as the Adoration of the Magi in the Hermitage, St. Petersburg. He was very successful and his name was given to a Roman street in which he lived (close to Piazza di Spagna).